Conventional straight or curved fluorescent tubes are often too large to replace filament lamps in a domestic setting. 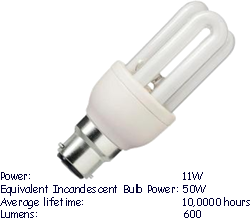 Therefore, compact fluorescent lamps (fluorescent light bulbs) have been developed. These have a size comparable to an incandescent (filament) lamp, and can be used in the same type of light fixture. That compact form was made possible by developing relatively small tubes (sometimes in a wound form) and compact electronic ballasts, which also enhance the power efficiency and reduce flicker. There are also non-integrated compact lamps, used with a separate electronic ballast, so that the lamp can be exchanged after its lifespan, and the long-life electronic ballast can be reused. The lifetime of a fluorescent lamp can exceed 10,000 hours if it is operated for long time intervals. Frequent 'switching on and off' substantially reduces the device's lifetime, therefore they rarely last that long in a domestic setting. Some electronic ballasts, particularly for compact fluorescent bulbs, have been optimized for frequent switching, making such lamps much less likely to 'blow'. Fluorescent lights are several times more energy-efficient than incandescent filament lamps. The use of a fluorescent lamp instead of an incandescent bulb can easily reduce the electric power consumption for a given luminosity by 80%. Such bulbs are marked with 'power equivalence brightness' so that consumers have an idea of how bright the lamp will be. The lamp bulbs are more expensive to buy than filmanet lamps, but the savings in energy costs can be a multiple of the increased price of the lamp, therefore they are economic to use. Also the reduced energy consumption results in reduced pollution and reduced emission of green house gases (carbon dioxide) from power plants. They are therefore 'good for the planet'. To consider all aspects of energy saving we need to consider its manufacture as well as domestic use. The energy consumption for producing a fluorescent lamp is several times higher than that for an incandescent lamp. However, that amount of energy is still much smaller than that used during operation, and also the device lifetime (see above) is much longer. Therefore, the additional amount of energy for production is compensated within a small fraction of the lifetime, and does not constitute a valid argument against using fluorescent lamps. Filament lamps were only about 5% efficient. 95% of the electricity was converted to heat, only 5% to light! While heat emission may be welcome in heated buildings in air-conditioned buildings, heating by lamps is undesirable, as it can significantly increase the electricity consumption of the cooling devices. Therefore energy savings by using efficient fluorescent lamps are much larger than the direct savings in the lamp in warm countries. Also the heating by lamps can also have potential dangerous side effects, such as creating the risk of fire when operated near inflamable fitments. After their lifespan, fluorescent tubes should be recycled, mainly because they contain a tiny amount of poisonous mercury - a few milligrams for compact fluorescent lamps, (somewhat more for long tubes). The emitted optical spectrum in a fluorecent lamp differs from that of incandescent bulbs it can make it more difficult to judge colors. Therefore, most fluorescent lamps are not suitable for certain special applications e.g. in the context of arts. Different light sources give out a different range of light frequencies. They also emit some frequencies more strongly than others. This has an effect on how we 'see' colour of objects. See the page on colour for more detail. The colour temperature can be relevant for health, but what colour temperature is appropriate depends very much on the circumstances. For example, a low colour temperature (e.g., 2500 K) is suitable for room lights in the evening, as otherwise the sleep at night may be impaired, whereas a higher colour temperature (4000 K or higher, closer to 6000 K as for daylight at noon) is better in offices to avoid tiredness. It is important to select lamps with appropriate colour temperature for the given application, and it is obviously helpful that models with rather different colours temperatures are readily available. Equally important to colour temperature is another number: the Colour Rendering Index, or CRI. Daylight and incandescent bulbs have a CRI of 100. That means the human eye perceives all the colours of the spectrum equally well under either daylight or incandescent bulbs. But for fluorescent bulbs the best have a CRI of only 95. That means that they exaggerate some colours, such as 'bringing out yellows' while downplaying other colours, such as the blues. This subtly changes the colour palette you perceive in a room. While an increasing number of CFLs have 'colour temperature' printed on the base of the bulb or on the packaging, CRI numbers have not yet been added, so it will take a bit of trial and error to determine which bulbs are suit your purpose the best.